I Made Fettuccine With One of the Most Hated Contestants on 'Top Chef.' Here's What Happened. I was filled with a paralyzing sense of excitement-dread when I walked into the hotel kitchen -- excitement because I’d be hanging one-on-one with a real life Top Chef contestant, and deep, deep dread because the chef I was paired to cook up fresh fettuccine bolognese for 12 with will go down in history as one of the show’s least-liked cheftestants. Ever. 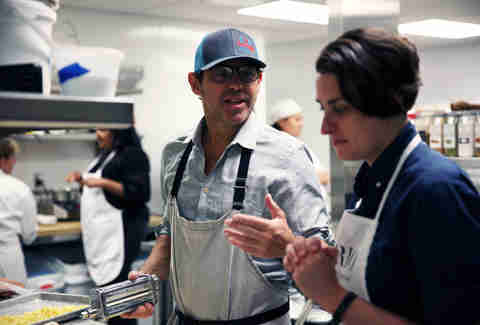 I mean, Chef John Tesar, the notorious, rabble-rousing restaurateur, opened Episode 1 of Season 10 with, “Anthony Bourdain says I’m probably the best natural chef he’s ever worked with,” which prepped the audience for a season of self-congratulatory, condescending arrogance -- and boy, did he deliver. I'm a bit of a fanboy when it comes to the Emmy-winning Bravo series, having dedicated countless hours of my life steeped in anxiety, awaiting Queen Padma’s quiet disapproval, her solemn, “Please pack your knives and go,” and Tesar's season happened to be my favorite ([SPOILER ALERT] it featured one of the show’s only female winners). But none of this is as intimidating as his accolades. Aside from starring in Top Chef, the man's a three-time James Beard semifinalist and a 20+ year industry veteran. Tesar has worked with kitchen legends Rick Moonen, Steven Tempel, Brendan Walsh, and David Burke, and is BFFs with Anthony Bourdain (he infamously inspired Kitchen Confidential’s “down-on-his-luck Jimmy Sears”). 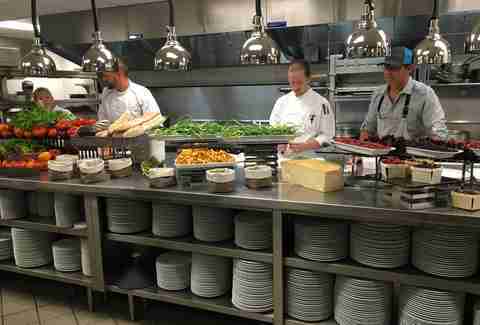 Most recently, he helped put his adopted hometown firmly on the culinary map with Knife at the Highland Dallas. And, despite (or maybe because of) all this success, a 2011 Dallas magazine cover story deemed him “The Most Hated Chef in Dallas.” In Tesar's case, all press is very, very good press. 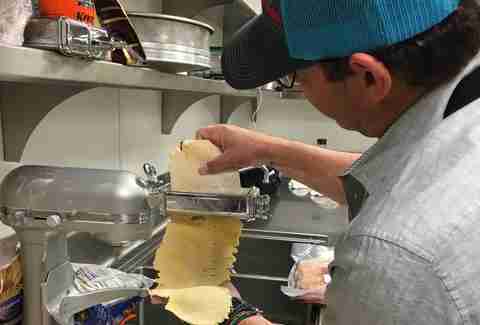 But deep within the brand spanking new LondonHouse Chicago, a Curio Collection by Hilton hotel, where three other wide-eyed members of the press and myself were paired off with our own professional chef for the afternoon, there was nothing to fear but overcooked fresh pasta. In fact, the spoiliest spoiler is that Chef Tesar is actually an incredibly kind chef. And he's got a lot of wisdom to impart, from what Top Chef is really like behind the scenes, to how to capitalize on a public persona, to how to easily make the freshest, tastiest pasta bolognese. Despite his reputation, he’s friendly and talkative with a laid back, cool-dad demeanor and easy smile. His cooking style is straight-forward, old-school New York, which, to be fair, is not for everyone -- including, apparently, the good people of Dallas, Texas. 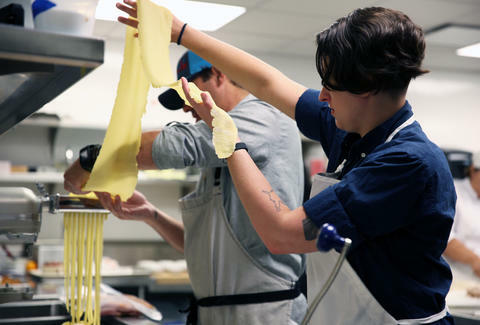 “When I took over for Dean Fearing at [Dallas fine dining institution] The Mansion, I came in and completely changed the program,” he told me, busy working a pillow of yellow pasta dough. “I threw out all the Southwestern food and started doing my food -- fresh seafood, steak. A lot of people, they hate change. That’s how I got the 'most hated chef' reputation. And as soon as that happened, all the reality shows came knocking at my door. The whole bad boy thing makes for a good story.” A smart businessman, Tesar merely took the neg straight to the bank. Aside from the villainizing thing, Tesar told me that what we see on TV is a surprisingly realistic portrayal of what actually goes down. “None of it is rigged,” he said. “Sometimes they’ll edit the order of things or leave some stuff out for a particular story, but all the cooking, the competitions, the twists, the judging -- that’s all very real.” Music to my ears. Tesar’s first gig was anything but glamorous. “I was 18, this stoner/surfer kid hanging out in the Hamptons, and my first kitchen job was flipping burgers at this local place. I liked it,” he smirked. “One of my roommates was working at this nice French place called Pierre’s, and she introduced me to the head chef, this dyed-in-the-wool old school French guy. Pierre took me under his wing, taught me everything he knew and I ended up pretty much running that kitchen.” Soon after, Chef Tesar went off to culinary school in France to pick up a few more skills, then returned back to Long Island, bought Pierre’s, and operated it for another six years. Tesar’s not just been around the block, he bought a house, had a family, and moved in. And all his years manifest in a no nonsense approach to cooking that’s equal parts comforting and refreshing. “Right now, we're dealing with a generation that wants to erase the past because they're so hungry for a future, an identity, that they're skipping a step,” he explained with the wisdom of a thousand Pepins. “And then they have a whole group of millennials around them to say, 'Hey that place is cool!' The service is bad and the food is mediocre but they label it 'cool' and it becomes a hot spot." Preach. 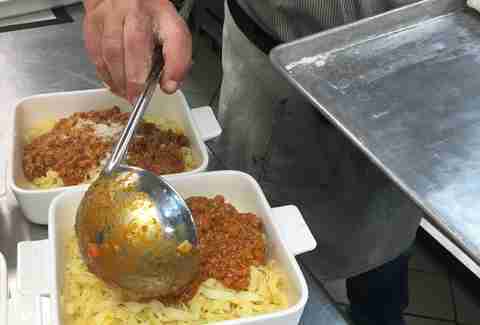 Chef had already started the bolognese (lean beef, tender veal, pork, slab bacon, carrots, onions, garlic, spices, milk, a bit of tomato paste, and a splash of white wine), so all we had to do was prepare the pasta. I like to think of myself as a fairly decent home cook, which is to say I can fry an egg, grill a steak, and I’ve never accidentally poisoned anyone (yet). But despite my Italian roots and ability to brown a mean meatball, I’ve never attempted fresh pasta. It always seemed super intimidating, all those delicate noodles and fancy machinery. But all you have to do is mix flour, eggs, and water, form a dough, knead it until the gluten starts to come together in a slightly sticky, just barely rubbery ball, and then pass it through a pasta machine until it’s thin enough to portion (we used an electronic machine, but Tesar swears by his manual hand crank). Either way, it’s just barely more labor intensive than boiling the dry stuff and a helluva lot more impressive. Homemade pasta reaches a perfect al dente almost as soon as you drop it in the pot, and boiling it much longer will result in a gelatinous, gluey mess. Our batch was in and out faster than I could spell bolognese, and I’m a professional food writer (also a horrible speller, but that’s between me and Google Docs, thank you). 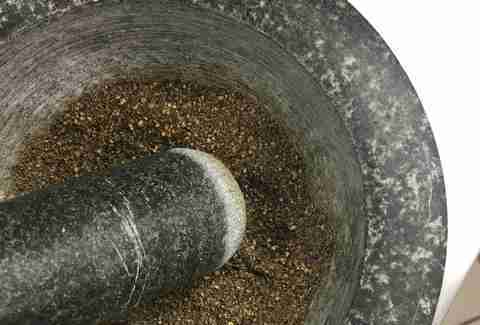 Near the end of my adventure, I was handed a mortar and pestle and tasked with transforming a heaping handful of peppercorns into a finely ground powder fit for human consumption. I got to work pounding my pestle into the marble basin, attempting to crush the little pebbles into oblivion the way you’d squash a bug with a shoe -- a very hard-shelled bug with a very heavy shoe. My method happened to be a good deal louder than it was effective, prompting another professional chef to come over, gently grab my wrist and send my white-knuckled pestle in a swirling motion around the poor, abused mortar, using friction to crush the spice against the sides instead of my pointless pounding. Sure enough, 40 seconds and two good sneezes later, my pepper pile was softer than a white sand beach. 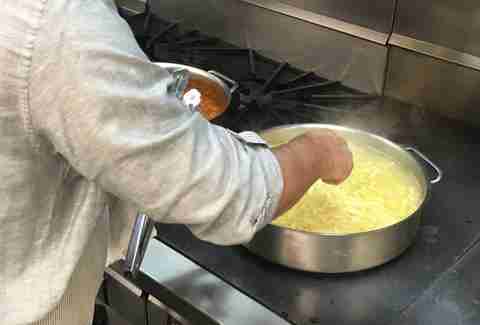 I even got to say it once while walking through the kitchen with a pot of hot fettuccine, and I don’t even think anyone knew how hard I was pretending to be on Top Chef. On Top Chef, under-seasoning and poor execution are the kiss of death. You can have the prettiest plate on the table, but if Tom says you skimped on the salt, your head is first to the chopping block. True to form, our collaborative pasta creation was not exactly the easiest on the eyes in comparison the other teams’ dainty dishes, but damn was it kind to the tastebuds. Everyone raved about the rich, soulful bolognese, the light, buttery noodles, and, of course, the perfectly ground pepper. Meredith Heil is a staff writer for Thrillist. Her palms are spaghetti, knees weak, arms spaghetti. There's vomit on her spaghetti already, mom's spaghetti. Follow her at @mereditto (mom's spaghetti).